Do you ever wonder what Sally's day to day was like in Dr. Fincklestien's observatory? We can't imagine that it was a walk in the park after all that wheelchair bound duck beast didn't have the best attitude. She seems like she was kept pretty busy with cleaning up after the inventor's sporadic inventions if he created a living rag doll we can't imagine what else he'd have bubbling away in his lab. So, It's no wonder that the curious rag doll wants to escape from her creator. We all can understand wanting to shake off that overprotective parent. Though hopefully none of us have ever slipped deadly nightshade in our parent's tea which Sally does whenever she needs a few hours in town. That's a lesson in the importance of giving your kid some freedom if we've ever seen one. It must have been frustrating for her when Halloween Town was in trouble only she seemed to sense it. If she could only communicate her concerns to Jack. If he realized her love for him while she was at it that wouldn't be bad, either! We don't know why he didn't notice her sooner. Maybe if she had been wearing this rendition of her ensemble Jack might have realized what a graceful creature this rag doll was. Her classic patchwork has a satiny texture with cut out shoulders and a chic, asymmetrical hem. 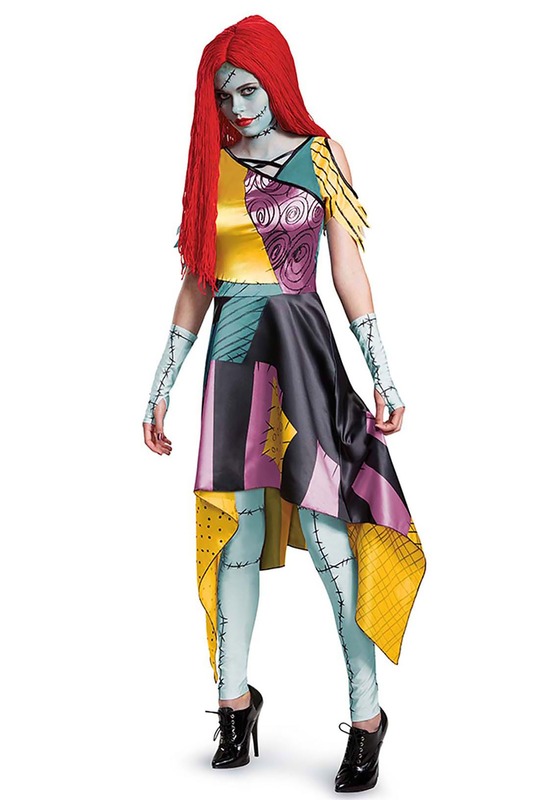 You'll be able to fully transform when you put on the stitched up leggings and long fingerless gloves. Slip on a Sally wig and paint your face and you'll be ready to take your place in Halloween Town outside of that musty observatory. After all, even rag dolls grow up! I love the quality of the costume and the tights. Unfortunately, can´t say the same thing from the wig.